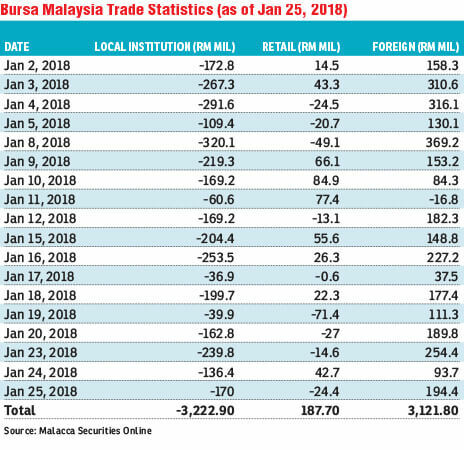 KUALA LUMPUR: Foreign investors have been making a return to the local market since the start of the new year, with a net inflow of about RM3.1 billion in the first 18 trading days. Local institutions, however, were making use of higher share prices to lock in profits. Local fund managers were the net sellers, with about RM3.2 billion in the same period. According to Rakuten Trade Sdn Bhd vice-president of research Vincent Lau, the selling seen among the local institutions was mainly to rejig their investment portfolios. “Most of them are gradually taking profit as they relook at their portfolios. It makes sense for some of them to lock in their profit. “Some of them are switching in their investments from exporters to banking, while the OPR (overnight policy rate) hike has also led to the ‘underweight’ of the REIT (real estate investment trust) players,” Lau told The Edge Financial Daily. Lau sees the selling as an anticipation of a slight pullback on Bursa Malaysia. But, he believes that the local institutions would eventually re-enter the local market. A fund manager with a local asset management firm, who requests to remain anonymous, commented that the timing of the local funds to re-enter the market is also dependent on the date of the upcoming 14th general election (GE14). Since the pre-election rally appears to have taken a breather after a strong run at the beginning of the year, it is likely to see local institutions time their entry when the Parliament is dissolved, he said. “When Parliament is dissolved, it’ll create some volatility in the stock market and I think that’s when the local institutions will deploy their money into the market. Right now, they will probably take some of the money off the table ahead of GE14 and re-strategise,” he said. Affin Hwang Asset Management Bhd (Affin Hwang AM) managing director Teng Chee Wei concurs that local institutions will turn net buyers sooner or later. He noted that Malaysia has a big pool of local investment funds. This local liquidity will come in handy to lend support to share prices on Bursa, for instance when foreign investors leave the domestic market in a big way. Teng believes with the anticipated rising cash positions, local institutions have to remain invested to generate yield. “If you look at institutions, the local institutions at some point will have to invest. Where else do they want to invest when the required return on their asset is a lot more higher than deposit rates?” Teng told The Edge Financial Daily. Given the rising cash position, Teng said the local fund managers will have to remain invested to generate sufficient returns of about 5% to 6%, or even higher, for their contributors or unitholders. Teng concluded that under such expectations, local institutions will have to eventually invest selectively and time their entry at some point into Bursa. On the difference in sentiment between local and foreign investors, Teng explained that it is due mainly to the influence of local noises. “For local institutions, there is an influence of the local noises. Foreigners do not stay here. Their lives are not affected day by day. However, as a local, you are impacted daily. There are very different perspectives all together … My conclusion is that when you talk to locals, they are very biased against the country. They are inherently biased from what they [have] experienced on a day-to-day basis. From a foreign perspective, it’s always on a big macro perspective and they invest using the macro approach,” he said. For Affin Hwang AM, Teng pointed that the firm has not sold on the recent rally and believed that there is still upside in the local bourse. He noted that it will be difficult to time the market but it could be too early to head for the exit now.